Background: In order to realize current aminoglycosides supervision in food and environment, our team improved the sensitivity and separation efficiency of the portable ITO detector, based on the technology of microchip capillary electrophoresis and contactless conductivity detection. 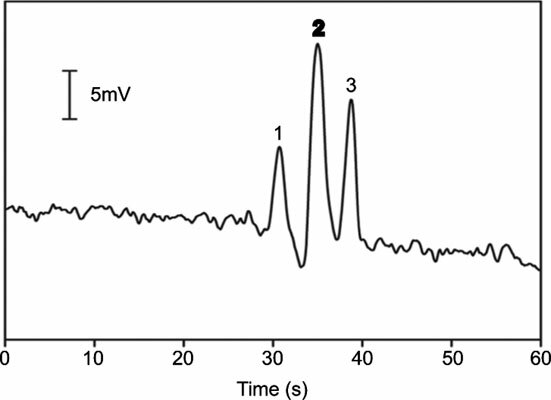 Experiment: Parameters (the separation voltage, buffer concentration, electrodes gap, elicitation frequency, elicitation voltage) were optimized for the detection of three aminoglycosides, gentamicin, kanamycin and streptomycin and the separation of their mixture in background electrolyte consists of 2-(N-Morpholino) ethanesulfonic acid (MES) and L-Histidine (His). The enhanced method was also applied to other types of aminoglycosides. Results: Under optimal conditions, the monitoring of three types of aminoglycosides obtained such a sensitive response that the limits of detection of gentamicin sulfate, kanamycin sulfate and streptomycin sulfate were calculated as 3.1 µg/ml, 0.89 µg/ml and 0.96 µg/ml, at signal-to-noise ratio 3, respectively. In addition they got separated completely from each other only in 40 s. The results of other varieties of aminoglycosides including tobramycin sulfate and amikacin sulfate also met the standard. Conclusion: We successfully proposed here an unprecedentedly portable, miniaturized and rapid microchip capillary electrophoresis contactless conductivity detection system to realize current aminoglycosides supervision in food and environment. Keywords: Microchip capillary electrophoresis, contactless conductivity detection, aminoglycosides, ITO-coated PET film, optimization, method validation. Keywords:Microchip capillary electrophoresis, contactless conductivity detection, aminoglycosides, ITO-coated PET film, optimization, method validation. Abstract:Background: In order to realize current aminoglycosides supervision in food and environment, our team improved the sensitivity and separation efficiency of the portable ITO detector, based on the technology of microchip capillary electrophoresis and contactless conductivity detection.